The Daily Digress: Guess what I made with buttermilk today? Guess what I made with buttermilk today? Pear clafoutis. If the French had their way, I wouldn't even be allowed to call a dessert involving pears "clafoutis." Actually, if the French had their way, I wouldn't be allowed in the kitchen. According to the ultimate authority, Larousse Gastronomique, clafoutis is "a dessert from the Limousin region of France, consisting of black cherries arranged in a buttered dish and covered with fairly thick pancake batter." The pits of the cherries, incidentally, are not removed and you have to spit them out as you eat. This sort of thing is very typical of the French, who are required by law to suffer a little, even when eating something nice. My mother-in-law makes it the correct way and it's delicious. When I told her about my plan to make it with pears and buttermilk, she winced in a way that only the French can and quickly changed the subject. That was kinder than telling me exactly what she thought of my idea. But I digress. I waited until she was gone and I peeled, cored and sliced four pears. I sprinkled them with a quarter cup of sugar and put them in the fridge in a closed container. According to the true recipe, you should do this to the cherries and let them sit for at least thirty minutes, so that's what I did. To the pears. one heaping cup of flour. a pinch of salt. I hope I get credit for this: It was French sea salt. another quarter cup of sugar. Now add (quel horreur!) one and a quarter cups of buttermilk. And whisk a little more. Butter a round baking dish. The Larousse says to use a baking tin, so you might want to try that. Put the sweet pear slices in the dish, sugar and all, and sprinkle the zest of one lemon on top of the pears. Now pour the batter over the whole thing and cook it at 350° for 35-40 minutes. let it cool to lukewarm before serving. You can sprinkle it with confectioner's sugar to make it look pretty if you like. Et maintenant, je vous présente... 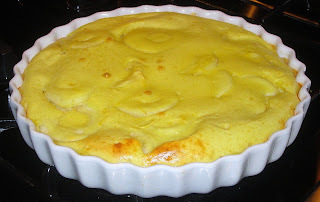 Le Clafoutis aux Poires avec Babeurre! I used your recipe, but substituted mangoes for the pears and added a touch of vanilla. Wow! It was SO good!